This newsletter also focuses on how waste pickers were involved in the struggle for sustainable development during Rio+20 (United Nations Conference on Sustainable Development) and the People’s Summit, the alternative gathering of social movements and activists. At these events, waste pickers from Brazil, India, Nicaragua, Dominican Republic, and Uruguay hosted and participated in many forums and attracted a wide audience. 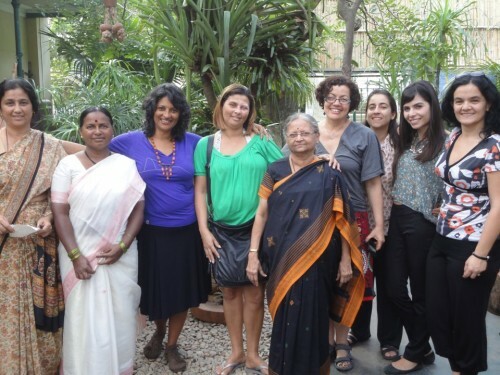 Also featured in this newsletter are interviews with women waste picker leaders, an article about the forced removal of informal workers, and updates from Asia, Africa, and Latin America. We hope waste picker’s groups can share their news or struggles so we can include them in future newsletters. Feel free to send the subscription link to others or visit the newsletter archive. For all other information, visit www.globalrec.org. Get an update from wastepickers groups and ongoing work in South Africa, Nigeria, Democratic Republic of the Congo, Ghana and Kenya, including upcoming events. Read more. 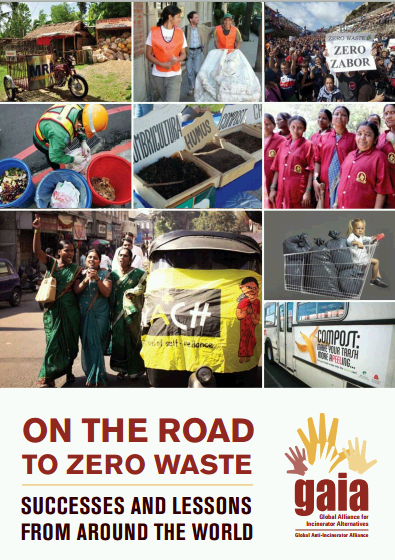 Read the last Alliance of Indian Wastepickers newsletter. Get updates from the struggles and demonstration, national meetings and organizational process going on in Argentina, Brazil, Uruguay and Venezuela. Read more. Bio of Felipe Rosario, communications coordinator for Red Lacre. Visit the Life and Voices section of the blog. Felipe Rosario is a waste picker with La Asociación de Recicladores del Eco-Parque Rafey in Santo Domingo. Read Felipe’s report on Red Lacre’s visit to Eco-Parque Rafey. 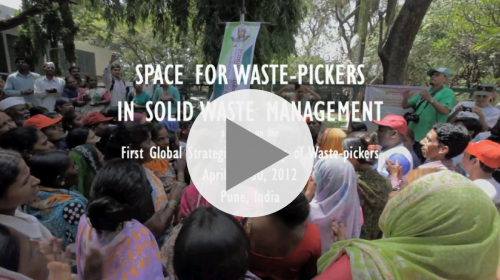 Video: Space for Wastepickers in Solid Waste Management Just Released! 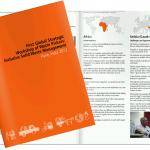 Watch the video detailing activities and lessons learned at the Global Strategic Workshop of Waste Pickers held in April 2012. Watch the video. Pune2012: Sharing experiences of integration and inclusion in municipal solid waste management systems. From April 27-29, waste pickers from Asia, Africa, Latin America and Europe participated in the First Global Strategic Workshop in Pune, India . This workshop was hosted by KKPKP, a trade union of waste pickers in Pune, and SWaCH on behalf of the Global Alliance of Waste Pickers, with support from WIEGO and the Inclusive Cities project. Read more and get the Workshop Report. Waste Pickers at Rio+20 and the People’s Summit – One Foot in the Social Movements, One in the UN Convention Center. 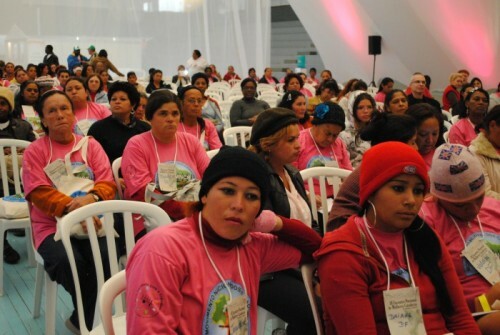 Representatives of the Global Alliance of Waste Pickers participated at both official Rio+20 events and at the alternative People’s Summit. They highlighted the environmental contribution of waste picking, threats facing workers and the importance of including waste pickers in municipal waste management systems. Read more. No to Incineration in RIO+20 Text. GAIA, MNCR and REDLACRE introduced an Anti-Incineration Declaration at Rio+20. It reads “As waste pickers and community organizations concerned about human and environmental health, we demand the adoption of a text with a vision of promoting policies that prioritize local solutions and create sustainable jobs for the community, instead of favoring large corporations through false technological solutions such as waste burial and incineration…” Read the full declaration. AlW, WIEGO, GAIA, and StreetNet participants in the gender radio program, Radio Pink. “Women Simply Want Equality”: Interview with Maria Mônica da Silva and Viviane Mertig of MNCR. While at the People’s Summit, Maria Mônica da Silva and Viviane Mertig of MNCR were interviewed about why it’s important to talk about gender, women’s roles, and public policies that support women. They also shared some personal stories about how they began their work as waste pickers. 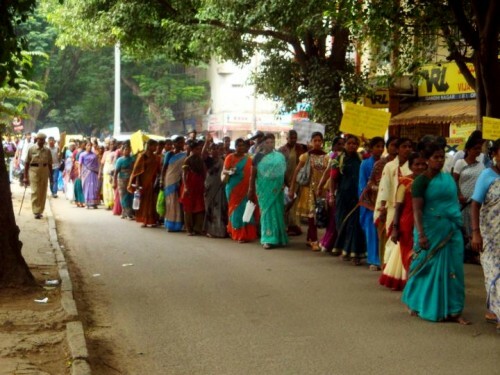 Stop the Forced Removal of Informal Workers during “Beautification” projects! 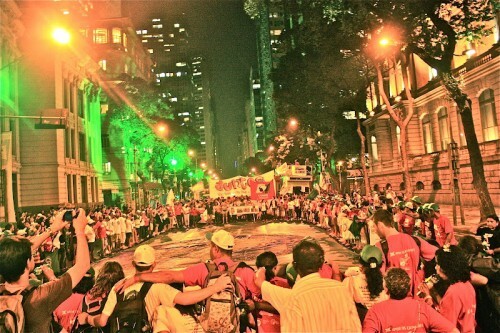 At a recent event organized by the National Movement of Waste Pickers in Brazil (MNCR), speakers from different social movements and organizations spoke about the removal of street vendors, homeless populations and waste pickers. As major cities focus on “beautification,” “revitalization” and other forms of attracting business and investment, activists are coming together with common demands. 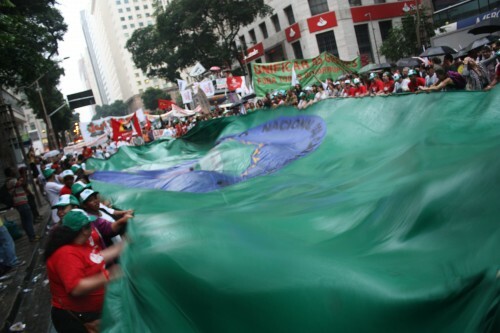 Waste pickers with the MNCR and from around the world embrace around the MNCR flag at the People’s March. Summary of MNCR’s demands. MNCR’s “Rio+20: The Future that We Want”, demands the transformation of the current destructive economic model into one of sustainable development that focuses on eradicating poverty, promoting environmental protection and preservation, social rights, and respect for all forms of life. It demands corporate responsibility for and an end to environmental destruction and denounces carbon credits and carbon producers. It decries destructive acts carried out by governments against poor workers such as street vendors, waste pickers and artisans, and demands their formal integration into the market. 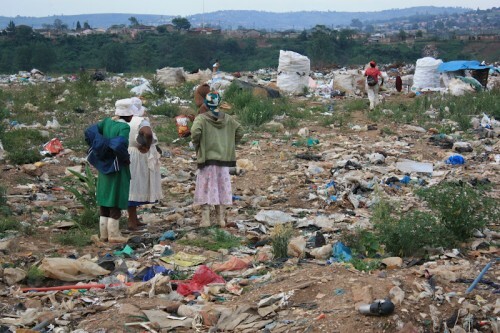 It demands the inclusion of waste pickers, small producers and traditional communities for their role in protecting the environment, and demands the financial support of their activities. Read summary of demands, including inclusive solid waste management proposals. Read about past and upcoming international events where wastepickers representatives will be participating. Read More. On the Road to Zero Waste: Successes and Lessons from around the World. 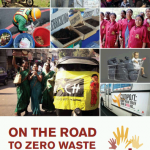 GAIA’s “On The Road to Zero Waste: Successes and Lessons from around the World” features stories from nine different countries including case studies of waste pickers in Pune, Mumbai, Buenos Aires. 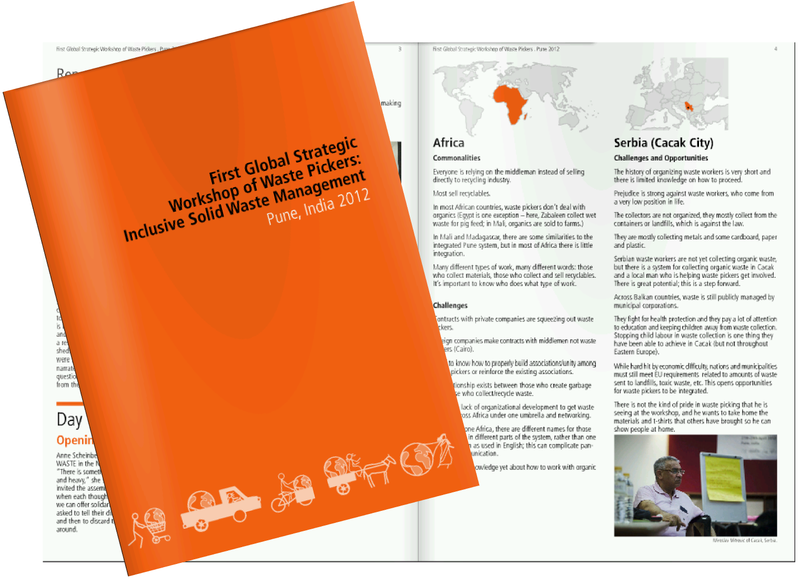 Global Strategic Workshop Report (August 2012). From April 27-29, waste pickers from Asia, Africa, Latin America and Europe participated in the First Global Strategic Workshop in Pune, India . This workshop was hosted by KKPKP, a trade union of waste pickers in Pune, and SWaCH on behalf of the Global Alliance of Waste Pickers, with support from WIEGO and the Inclusive Cities project. 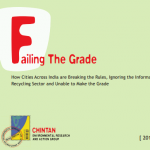 Failing the Grade – CHINTAN (August 2012). Indian policies and rules, while not perfect, have some important safeguards and recognition for waste pickers. However, municipalities, urban policy makers, and private companies ignore them while conducting business in solid waste management. In so doing, they bypass the environment and the poor. In this context, most formal players, both state actors and non-state actors, fail the grade. No single city has fully and comprehensively implemented all the rules and followed the spirit of the policies laid out for waste pickers and other informal sector actors in India. Get the report.